Product #16208 | SKU CP-ITV4-S | 0.0 (no ratings yet) Thanks for your rating! 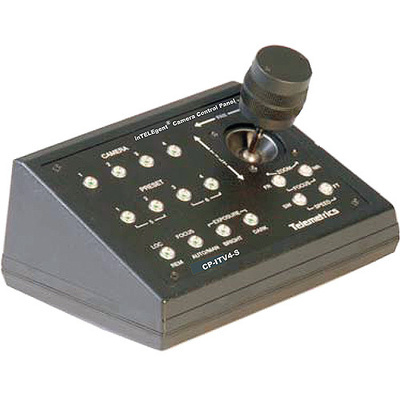 The Sony EVI / BRC Camera CP-ITV4-S Control Panel by Telemetrics is an RS-232 joystick panel that controls up to four Sony PTZ cameras from the EVI and BRC line of models. It connects directly to one and the rest get daisy-chained in. Please see specs tab for a compatibility list. The panel features a proportionally-rated joystick that controls pan, tilt, and zoom, and switch buttons that adjust the focus and iris of each camera's lens. Six of the switch buttons are preset with memory positions for pan, tilt, zoom, and focus and are applicable to all the connected cameras. Also, you can interconnect the panel with other RS-232 panels, both local and remote ones, and thus control cameras from more than one location.